Although I spend many of my waking (and non-waking) hours thinking of food, even if I love creating menus in my mind, though it is I who subscribes to food magazines and spends hours poring over cookbooks…I am not the only one in this house that dictates the dishes. Albeit I am the one who is usually hogging our stove, or muttering things like “What if we use white wine instead of vinegar in the adobo?” while he desperately tries to watch Entourage, C definitely has his niches in the kitchen. He makes all the sinigang (Filipino tamarind-based soup) dishes (and really good ones at that) and does all the steaks, and if there is a grill around I don’t even try to meddle, I just enjoy the results. He also contributes his fair share of ideas when it comes to putting together new dishes (if something is going to be his dinner, he will want a say for sure…dessert, he is just not that into). This is one dish for which credit goes to C. We were lying in bed and I was pondering (out loud) over what to do with the small local scallops I had bought in the market. 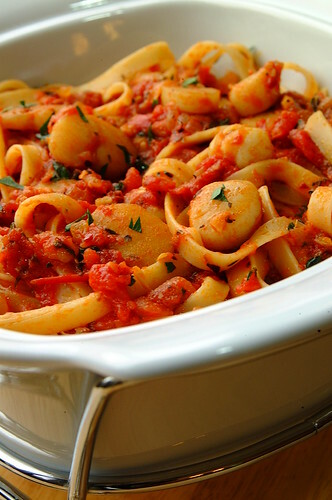 He mulls this over a bit and declares, “We should use it in pasta…that spicy tomato sauce…Arrabiata…with scallops!” Mmmm! Not bad…sounds good actually! I started going over what I would need, when suddenly he turns to me again with a sly look and adds, “With bacon!” This man sure knows the way to my heart. – Cook pasta as per package directions in a saucepan of generously salted water. Drain and set aside. – In another saucepan, heat olive oil, then sauté onion and garlic until onion is soft. – Add bacon, chili flakes, and all the dried herbs. Sauté until bacon is cooked. – Add tomato and thyme (if your oregano is fresh, add it in at this point), stir, and let simmer, covered, for about 10 minutes to get the flavors blended. – Check on your sauce, and add salt and pepper to taste. Toss in the scallops, cover, and cook for about 3 minutes or until just cooked. Do not overcook (they will turn to rubber)! – Add parsley (if you are using fresh basil, add it in at this point), cooked noodles, and toss to combine. This is another dish that is a happy mix of all the elements we like: seafood (C), bacon (me), and heat (both of us). I used small local scallops, not the big imported ones that you see in fancy restaurants. The big ones are much more expensive, and are better off being seared and served with a treatment where the spotlight is totally on them. No need to break the bank for this dish. C’s quite proud of this meal, and rightfully so. I can say with all certainty that this was one of his better ideas (along with insisting we buy those water bottles in Barcelona)…one that will be repeated for many meals to come 🙂 This is my entry to Presto Pasta Nights, a food blogging event created by Ruth of Once Upon a Feast. She does a weekly roundup every Friday so we can all have delicious new pasta dishes in time for the weekend. To all Filipinos out there: Happy Independence Day!! !